"We're gonna slowly raise our prices so we can provide you with more wonderful, exclusive, won't-even-make-it-to-dvd content from countries you didn't know existed. That, recorded stand-up comedy, and politically biased documentaries. Because we and other companies have been doing a fantastic job lately of giving customers what they want." "You guys all have phones, don't you?" @Empshok, I know you're making fun of netflix, but can we add some hate for hulu and having 15 commercials per 25 minute episode of My Hero Academia? @ThePandaPool , anime1.com. Save yourself hours of your life watching commercials and still get 1080p quality. @ThePandaPool , I don't have those accounts so I wouldn't know about them. But with the trend of businesses today, I assume they are equally terrible. I think they assume that we'll just get used to it over time. That we'll just go quietly into that shjtty night. I see that trend ending in one of two ways: legally, or with blood, but either way ends in favor of the consumer. @ThePandaPool , okay, let me clarify. If companies continue to refuse to put customers first, people will get angry. The angrier they get, the more likely to act, and the more drastic actions they will be willing to take. If the companies beat back the people legally, at that point I anticipate riots, property destruction, and possibly bloodshed. I do not hope for that. In fact I hope these companies straighten up so we can depend on them. @ThePandaPool , Seriously? That's ridiculous, even regular half hour shows are typically split 8-9 min with 22-22 of actual show. Commercials are why I watch anime on pirate sites. Commercials, and the fact that I like having all the anime I like in one spot. @ThePandaPool , you don’t have crunchy roll ? It has tons of shows and no commercials, but I have Hulu too, how much is the upgraded no commercials Hulu ? @DrSin, I only watch a few anime shows, so no... I dont know how much the higher level hulu is. Won't get it on principle. @DrSin, I just dont go directly to anime. If something peaks my interest, I'll get obsessed or binge, but I would rather have other options too. @DrSin, not so easy with my household I have multiple TVs with my kids using my account, and would get people blocked. @brenno263, oh, they are the one that have upset me the most. I predict this going full circle. Someone will eventually end up conglomerating these platforms into one all-inclusive streaming service at a cheaper bundle price. 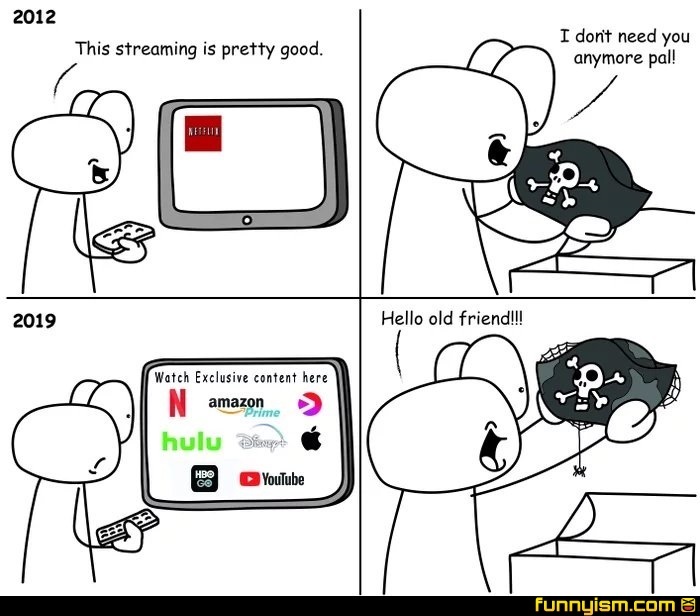 Then boom, we basically have cable channel packages all over again. @Jolly jackhammer, It’s like that Big Mouth show where their bulbous, disgusting lips can be seen from behind.